Everything you need to know about the Weekly Challenge system. Our Fortnite: Battle Royale Weekly Challenges guide features a list of challenges, reset times and rewards information with tips for completing each one. Weekly Challenges in Fortnite: Battle Royale provide you with a collection of varied tasks to complete, with a fresh set added to the game on a weekly basis. 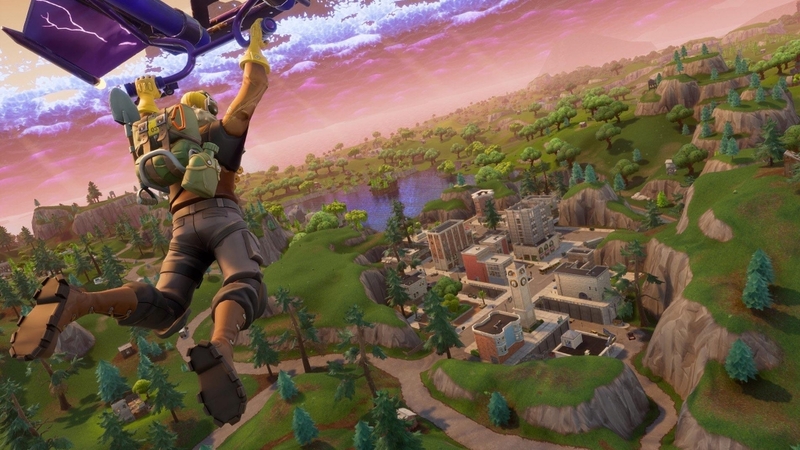 These challenges might involve eliminating enemies with specific weapons, tracking down unique items across Fortnite's map or simply landing in a number of locations. Some of these tasks may be more difficult than others, and so you can rack up any number of Seasonal Weekly Challenges over time if you struggle to complete them in any given week - or if you simply run out of time. Just remember that you've got to wrap them all up before the end of the current season, or they'll vanish permanently. In this article you'll find a breakdown of every Fortnite: Battle Royale Weekly Challenge which are currently live in-game. Many of them are pretty self explanatory, but we've got tips and tricks to help you complete some of the tougher tasks. Just click the links to jump straight to the help you need! Season 7 of Fortnite is now under way, and we've overhauled the guide so it includes all of the latest information. At the top you'll find a breakdown of the new Season 7 Challenges, and we'll slot in links to all of our coverage as and when we run it! 1. What are the current Season 7 Challenges? 2. What kind of Weekly Challenges are available? 3. When do Weekly Challenges reset? 4. How do you abandon a Weekly Challenge? 5. What are the rewards for finishing Weekly Challenges? 6. What Season 6 Weekly Challenges were released? 7. What Season 5 Weekly Challenges were released? 8. What Season 4 Weekly Challenges were released? What are the current Season 7 Challenges? Below we've posted a complete overview of all the Season 7 Challenges that have been released so far. We'll be updating this list throughout the season, and you can use the links to get tips and advice on some of the trickiest tasks of the week. What kind of Weekly Challenges are available? Here are a handful of the Weekly Challenge types that we're aware of in Fortnite: Battle Royale, including details of what you'll be rewarded with typically. To finish this you're going to have to survive longer than 150 other poor souls. Note from the name of this challenge that you must complete the objective while in the Solo queue. No teaming up with friends for this one we're afraid. To finish this, simply go around the map hitting everything with your Pickaxe. It won't be long before you complete this challenge! This one tasks you with using an item like a "Bush" or "Launchpad". You'll come across them naturally while playing, so just make sure you use them when given the opportunity. Objective: Deal damage with X to players. Each week you'll usually be tasked with dealing damage to players with a specific weapon. Get hold of one as soon as possible and ensure you're using it at every available opportunity. Eventually you'll complete the challenge! In this task, you'll have to search for chests in a specific location. To complete it quickly, land here and go about running about and cracking them open. Check out out chest map guide to make this challenge even easier every week! A unique challenge that crops up most weeks, this one tasks you with visiting different locations dotted across the map. We've had Ice Cream Trucks and Gas Stations, so try and memorise points of interest when you're in game to make finding future locations a little easier. Making its first appearance in Week 3, it required players to find and land on different bullseyes dotted across the map. Potentially the trickiest of the lot, these Treasure Map Challenges task you with locating a Treasure Map in one of Fortnite's main locations. It's then a case of giving it a read and figuring out where the treasure is according to the clues you're given. You'll be given three points of interest on the map and you'll need to pinpoint a location that resides between them all. Make sure you take a look at our map locations guide for an overview of all the locations in Fortnite: Battle Royale! Often you'll be tasked with finding a certain number of strange items across Fortnite's map. These range from Hidden Gnomes to Rubber Duckies which'll make noises whenever you're close to discovering them. This one is pretty self explanatory. All you have to do is eliminate enemies with a certain weapon type. For a complete list of all the weapons in the game, check out our weapons tier list with stats page! You'll have to defeat enemies in a certain area. We recommend landing at whichever point on the map it is and constantly seeking out fights until you've got it checked off! Added in Season , you'll need to search for certain posters or objects around the world using the emote wheel. When do Weekly Challenges reset? New Weekly Challenges will turn up every Thursday (previously Tuesday), and the exact time for the switchover is 4:00pm PST. That's 7:00pm EST, 12:00am in the UK and 1:00am in Europe. How do you abandon a Weekly Challenge? Unlike Daily Challenges - which have since been replaced by the Weekly Challenge system - you can't abandon them anymore. Instead you'll simply have a bank of challenges to complete over time, so you don't need to worry about picking and choosing. Work towards whichever take your fancy, and those you don't complete will still be available to complete until the current Season comes to an end. What are the rewards for finishing Weekly Challenges? Completing each one of the Weekly Challenges that we've highlighted in this guide will reward you with 500 experience points. Each Weekly Challenge rewards you with a different number of Battle Stars which are used to level up your Battle Pass ranks. You can earn either 5 or 10 stars per challenge depending on its difficulty. Completing Weekly Challenges are a great way of increasing your Battle Pass rank and working towards unique cosmetic rewards. What Season 6 Challenges were released? Here's a complete overview of all the Season 6 Challenges that were released. Do bear in mind that new players joining during Season 7 will not be able to access these challenges. What Season 5 Weekly Challenges were released? Here's a complete list of all the Weekly Challenges that we covered during Season 5 of Fortnite. Note that you can no longer complete these specific tasks, and we include them purely to keep a record of what was available in the past. What Season 4 Weekly Challenges were released? Here's a complete list of all the Weekly Challenges that we covered during Season 4 of Fortnite. Note that you can no longer complete these specific tasks, and we include them purely to keep a record of what was available in the past. *With the release of patch V.4.2 this challenge was changed to "Revive players" with the same rewards.